(2011) "God Gave Me You"
"Honey Bee" is a song written by Rhett Akins and Ben Hayslip and recorded by American country music artist Blake Shelton. It was released in April 2011 as the first single from Shelton's 2011 album Red River Blue. The song reached number one on the US Billboard Hot Country Songs chart in July 2011. On November 30, the song received a Grammy Award nomination for Best Country Solo Performance, but it lost to Taylor Swift's "Mean". 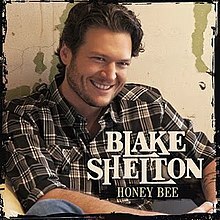 Blake Shelton debuted "Honey Bee" at the Academy of Country Music awards telecast on April 3, 2011, where he also sang "Who Are You When I'm Not Looking". "Honey Bee" was released to digital retailers immediately after the broadcast. Rhett Akins and Ben Hayslip, two-thirds of the "Peach Pickers" writing ensemble, wrote the song. Akins said that he first thought of writing a song called "Huckleberry" after seeing an article in Billboard magazine about former Arkansas governor Mike Huckabee. He then changed the word to "honeysuckle", and came up with the line "You be my honeysuckle, and I'll be your honey bee." Akins said that he thought that "it was a different way for the guy to say, 'we should date, I love you.'" The lines "You'll be my Louisiana, I'll be your Mississippi / You'll be my Little Loretta, I'll be your Conway Twitty" refers to the Conway Twitty and Loretta Lynn duet "Louisiana Woman, Mississippi Man" on the album of the same name. The music video premiered on NBC.com on May 10, 2011. It was filmed in California, and directed by Trey Fanjoy. The video features Shelton stopping at a roadside stand, where a young woman (portrayed by Amra Silajdžić) is selling honey and other related products. Shelton purchases a jar of "Tupelo Honey" from the seller. Shelton frequently returns to the stand, buying more and more products (which, as the video changes scenes from the stand to Shelton's living room, the room becomes more and more filled with products from the stand), until one day he passes the stand and sees an "out of business" sign. The seller approaches with another sign ("Sorry, out of honey") and Shelton finally gets her to come with him. Matt Bjorke of Roughstock rated the single four stars out of five. His review praised the "charisma" in Shelton's voice and thought that the song had a "timeless" feel to it. Slant Magazine reviewer Jonathan Keefe criticized the lyrics, but praised Shelton's vocals. C. M. Wilcox of The 9513 gave the song a thumbs down, saying that the lyrics were written in a "repetitive, fill-in-the-blank structure," and criticized Shelton for recording "ear catching but substantively bankrupt country boy hokum." The song sold 138,000 digital downloads in its first week, setting a new record for the most first-week downloads by a male country singer. As a result of the downloads, the song debuted at number thirteen on the Billboard Hot 100 chart dated for the week ending April 23, 2011. This entry makes him the highest-debuting male country artist on the Hot 100 since Garth Brooks (recording as Chris Gaines) debuted at number five in September 1999 with "Lost in You". "Honey Bee" also debuted at number 31 on the Hot Country Songs charts and number 58 on the Canadian Hot 100. By its seventh week, the song had gone digital gold, making it the fastest rising single ever to sell over 500,000 digital copies by a male country soloist. It became Shelton's fourth consecutive and ninth Number One single on the country chart dated June 25, 2011. It has sold 2,372,000 copies in the US as of September 2013. ^ Stromblad, Cory (April 4, 2011). "Blake Shelton Debuts New Song, 'Honey Bee'". The Boot. Retrieved April 14, 2011. ^ Conaway, Alanna (9 April 2011). "Blake Shelton — "Honey Bee" Lyrics Uncovered". Taste of Country. Retrieved April 14, 2011. ^ "CMT : Videos : Blake Shelton : Honey Bee". Country Music Television. Retrieved June 17, 2011. ^ Bjorke, Matt (21 April 2011). "Blake Shelton — "Honey Bee"". Roughstock. Archived from the original on 9 April 2011. Retrieved 31 May 2011. ^ Wilcox, C.M. (April 11, 2011). "Blake Shelton — "Honey Bee"". The 9513. Archived from the original on April 15, 2011. Retrieved April 14, 2011. ^ "Blake Shelton Has A Record-Breaking Week". All Access. 13 April 2011. Retrieved April 14, 2011. ^ Trust, Gary (13 April 2011). "Katy Perry Takes Third Week Atop Hot 100 with Airplay Boost". Billboard. Retrieved April 14, 2011. ^ Trust, Gary (25 May 2011). "BLAKE SHELTON'S "HONEY BEE" GOES DIGITAL GOLD AND MAKES CHART HISTORY". Billboard. Retrieved May 25, 2011. ^ a b Paul Grein (September 25, 2013). "Week Ending Sept. 22, 2013. Songs: The Brit Is Back". Chart Watch. Yahoo. ^ "Blake Shelton Chart History (Canadian Hot 100)". Billboard. Retrieved April 14, 2011. ^ "Blake Shelton Chart History (Hot 100)". Billboard. Retrieved April 14, 2011. ^ "Blake Shelton Chart History (Hot Country Songs)". Billboard. Retrieved April 14, 2011. ^ "American single certifications – Blake Shelton – Honey Bee". Recording Industry Association of America. Retrieved March 31, 2016. If necessary, click Advanced, then click Format, then select Single, then click SEARCH. ^ "Best of 2011: Hot 100 Songs". Billboard. Prometheus Global Media. 2011. Retrieved December 9, 2011. "When Somebody Know You That Well"
This page was last edited on 22 November 2018, at 21:25 (UTC).